Poll Shows Bloom Has Fallen Off Olympic Bid For Most Bostonians : The Two-Way Opposition to the Olympics has grown by 13 percent since Boston was chosen by the U.S. Olympic Committee to be the American bid for 2024. 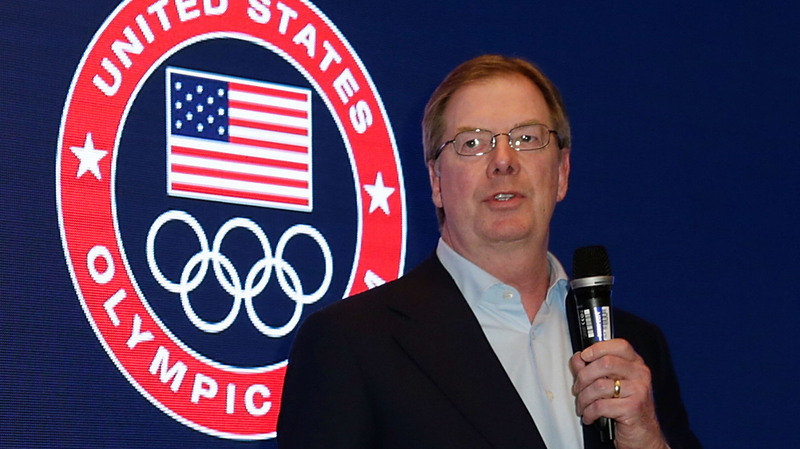 The U.S. Olympic Committee has chosen Boston to bid on hosting the 2024 Summer Olympics. Committee Chairman Larry Probst is seen speaking last February. Just a little more than a month since Boston was chosen to become the next American city to put together an Olympic bid, Bostonians seem to be getting cold feet. A poll commissioned by NPR member station WBUR found that a plurality of Bostonians (46 percent) "oppose the idea of bringing the Olympic Games to the Boston region in 2024." WBUR's Asma Khalid tells our Newscast unit that just 44 percent of those polled support the bid. "The opposition has grown by 13 points since one month ago, right after Boston got the nod," Asma reports. As we reported at the time Boston was chosen, the Olympic bid has always had its critics. One group called No Boston Olympics criticized the lack of transparency. And the group's leader, Chris Dempsey, added: "Olympics do force you to build a bunch of stuff. But it's stuff that you really don't need." Still, in a January poll 51 percent of Bostonians said they supported the bid, and only 33 percent opposed it. Asma spoke to Steve Koczela of MassInc, the company that conducted the poll. He said maybe the parade of winter storms and the transit meltdown have led people to rethink their position on the Olympics. "People seem to be feeling as though there are other things that they'd like to spend money on at the moment," Koczela said. -- 47 percent said it would make them less likely to support the bid if public funds were used to build stadiums and venues for the Olympics. -- 40 percent said they would be more likely to support the bid if public funds were used to improve the transit system.